Bitcoin has finite global supply, no more than 21 millions of token are available. No exceptions. His analysis is pretty clear, by statistics, no more than the 1% of people all over the world will be able to possess more than a tiny amount, revealed as 0,28 Bitcoin. Nothing changes if they are rich or poor. This stat is obtained calculating 21 millions of available Bitcoin over the current world population on a 5/10 years timeframe. So we technically can address a little investment on cryptocurrency of about 1800$ (USD) and we will be included in the 1% world richest people in terms of “Bitcoin”. In the next years Bitcoin, will be more subject to scarcity, in a way never seen before. This scarcity will increase gradually when more investors and financial institusions make the big jump over the cryptocurrency business. As stated above, Bitcoin is based on a cryptographic protocol that binds the whole reserve to a total of 21 millions tokens. So we’re currently at an early stage of this technology and we can exploit as a long term financial reserve. As many cryptocurrency enthusiasts said: HODL. But, we also know that time is running out. Big fishes are planning to join the party in 2019 and holding a single Bitcoin will be very difficult time by time. The aspect of “more investments = more value” represents a matter of scarcity, of course. But, a lot of scarcity is also generated if we lose Bitcoin wallets because there’s no way to recover keys. In that case our coins are gone, forever. It may happens, and for this reason we need to consider, as a decrease of supply, all the bitcoin burnt in that way. In 2017 Chainalysis released statistical data about 4 million Bitcoin permanently lost as a result of loss, theft of wallets and access keys. This parameter is not considered by global market cap on cryptocurrencies. 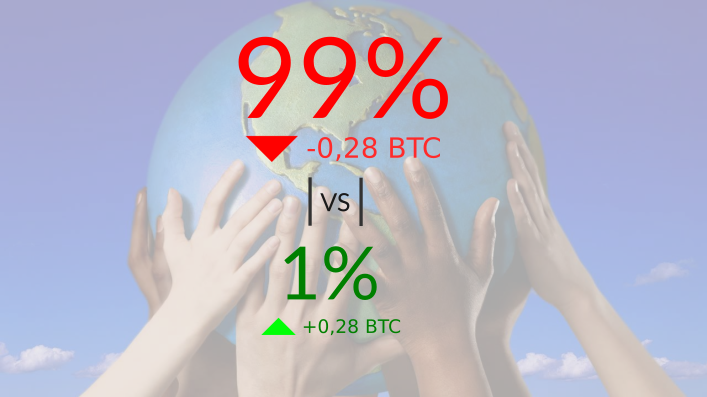 Now, this can give more value to the Steve Lee analysis; in fact, with 18 millions of Bitcoin available, only a potential of 1% can be so lucky to have more than a miserable 0,28 BTC in his wallet. It sounds great, isn’t it? And it’s mainly true. How many times we heard about the story that the 1% of people hold the 99% of richness in the world? Now, it’s your turn! Are you ready to be the next billionaire? Eeehh… I don’t believe so, it’s not so easy. So it’s not. At the moment I can tell you that I’m an holder of Bitcoin, and this make me quite nervous, anything but rich. Most of people going to CEX.IO, and in 5 minutes get into the cryptocurrency business with a decent capital, but how many people are using a storage to mantain their tokens with security? I mean, I’ll be less worried when I grab my cash from my investment but for now, I want to avoid the awkward situation where my crypto will completely vaporized. What I don’t see from people is getting out their wallets to pay 99 dollars for tiny pendrive that stores cryptocurrency tokens in absolute security: Yes Sir, only 99 bucks for a cold wallet storage for your future. So do a favour to yourself grab one Ledger Nano S, and relax. I did it yesterday, and I did quickly because no one wants to ends up in the Chainalysis study as a lost wallet and no one would loose the opportunity to have some cash invested in Bitcoin in 2018.